The role of the HR function is changing dramatically, and smart organizations are looking more closely at the effectiveness of their HR processes in helping them to achieve their strategic objectives. An HR 'diagnosis' is done through one very essential tool: the HR Audit. Like a public accounting firm that audits accounting practices to make sure there are no mistakes or missed opportunities, your HR Audit will cover everything from recruiting and employment to compensation, benefits, discipline and termination. We make sure you're in compliance legally, and recommend ways to improve your overall bottom line through more efficient and effective HR processes. We identify what HR processes are working well and opportunities to improve your HR services and ultimately increase your ROI on your investment in your employees. If you're reading this, you probably already realize you are not maximizing your organization's 'people' potential and would like to find out why and how. That is where we come in. As noted above, our primary goal is to find out what is working, what isn't working, what could be working more effectively and to present opportunities and solutions to help you increase your bottom line that include engaging employees in the organization's overall well-being and profitability. Perhaps you are considering acquiring a company. It would be helpful for you to know, in advance, what is the status of the company's HR processes and if there may be any employment related liability in the potential acquisition. Maybe you recently lost your HR executive or manager. Prior to filling this position it would be helpful to have an evaluation of the effectiveness of the HR department. 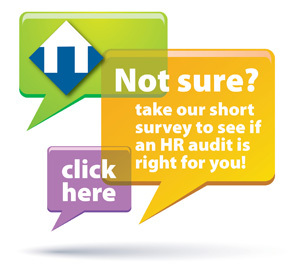 How long does an HR Audit take? It depends on your orginizations size – typically 4-8 weeks. How much does an HR Audit cost? This is also based on your organization's size – our costs are very reasonable and are calculated on a per employee basis. There is also special pricing for non-profit organizations. After the Audit, what happens next? 1. An Excel spreadsheet identifying the specific HR processes and practices currently in place, their current effectiveness and efficiency, and recommendations for improvement. 2. A prioritized Action Plan for improvements that you can implement immediately or in the timeframe you desire. 3. Their managers begin to question our clients' HR practices in terms of their efficiency, effectiveness and legal impact.